An action thriller set in a depressed near-future, Escape From New York carries A-movie ambitions with a B-movie ethos. The story of a lone hero attempting to rescue the President from the wasteland of a Manhattan turned into a prison is delivered on a bare-bones budget but with plenty of flair. It's 1997, and after a crime rate explosion, all of Manhattan Island is turned into a maximum security prison, protected by a 50 foot perimeter wall and mines. Convicts are deposited into Manhattan and never allowed out, with security controlled from a police headquarters on Liberty Island under the leadership of Bob Hauk (Lee Van Cleef). 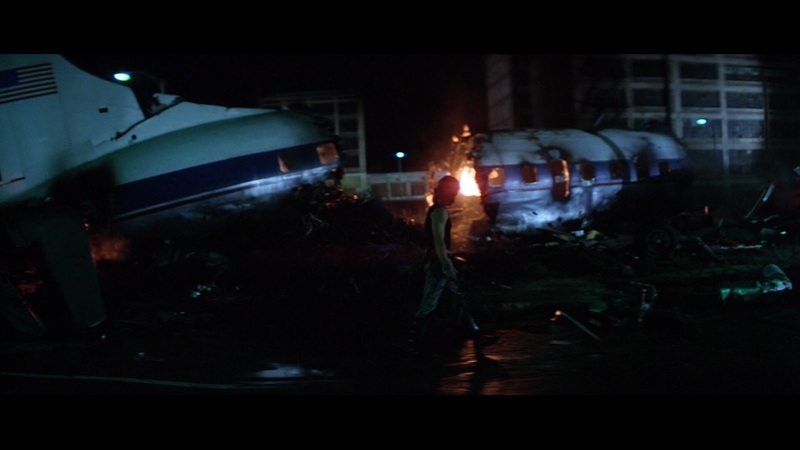 Air Force One with the President (Donald Pleasence) on board is hijacked by anti-government revolutionaries and intentionally crashed into Manhattan, but the President survives by sheltering in an evacuation pod. He is captured and held hostage by unknown prisoners. 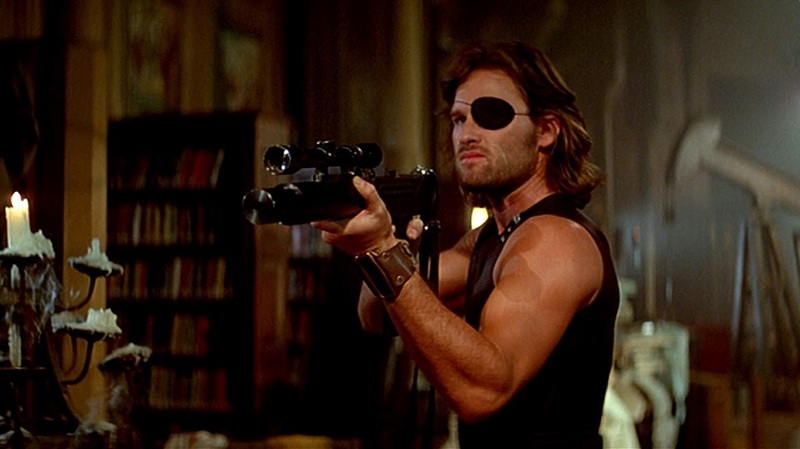 Hauk recruits newly convicted Snake Plissken (Kurt Russell), an ex-Special Forces war hero who has turned to a life of crime, to mount a one-man rescue mission and retrieve a crucial cassette recording carried by the President within 24 hours. Snake lands a glider on top of the World Trade Center, and soon has to fend off crazy killers marauding the streets. He encounters Cabbie (Ernest Borgnine), Brain (Harry Dean Stanton) and his girlfriend Maggie (Adrienne Barbeau), leading him to the self-proclaimed Duke (Isaac Hayes), who commands the largest gang of criminals and is likely holding the President. Fresh off his unexpected success with Halloween, director John Carpenter was provided enough clout to helm an impressive group of stars in an ambitious story requiring relatively elaborate sets. The clever premise is brought to life through the imaginative use of early simulated computer effects, Carpenter stretching his budget as far as it would go to bring to life a bleak vision of the future. The film clocks in at under 100 minutes and is ultimately a straightforward and fairly routine chase-and-rescue film, but also brimming with panache and attitude. Thematically, Escape From New York logically extrapolates from all the downbeat 1970s crime-drenched New York-based dramas. Death Wish had the city in the grips of an out-of-control crime wave, while The Warriors saw the gangs effectively taking full control of the streets. Carpenter carries the trend to its conclusion, and now Manhattan is turned into a prison, abandoned to the low lifes who chased away civilization. While the idea is rich, the execution is constrained by the budget. Once Snake makes it into the city, the action sequences are restricted to basic arm-waving clashes with zombie-like randoms, and then its quickly onto encounters with Cabbie, Brain, and then a standard confrontation with Duke's entourage. A no-rules two-man brawl in the boxing ring with Snake forced to take on the local brute with bats-as-weapons smacks of irrelevant padding. Overall, the city-as-a-prison environment appears limited to a few blocks, a couple of sets, a few overturned cars, and a rather limited population density. Carpenter does a fine job with nighttime filming, and plays with backlighting, shadows and silhouettes to good effect. 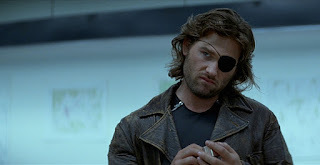 But by far the best thing about Escape From New York is the character of Snake Plissken. Kurt Russell oozes pissed-off cool, his long hair and eye patch creating a seminal image. At every turn he is confronted with an "I heard you were dead" greeting, which does not appear to surprise him. Dismissively swatting off attackers with either fists or assorted weapons, he is only strained by the impossible time limit imposed on his mission by Hauk. The secondary cast brings together a clutch of respected veterans comfortable in schlocky surroundings. Lee Van Cleef, Ernest Borgnine, Harry Dean Stanton, and Donald Pleasence add plenty of esteemed heft, and spout their lines with conviction but without enjoying much character evolution. Escape From New York is a joyride through the urban jungle of a dismal future. The overarching idea may be more interesting than the details, but the taxi trip is lively all the same.